Shallow groundwater at the site became contaminated due to the leaks of a chromium plating factory operating since 1950s. Groundwater monitoring since 2008 has shown a plume extending downgradient the source area and, in 2011, the in situ P&T system shown an asymptotic Cr(VI) concentration trend. In addition, Hexavalent Chromium concentrations and geochemical sampling data indicated that no natural attenuation was occurring. In early 2012, an application of Metals Remediation Compound (MRC) and 3-D Microemulsion® (3DMe) was performed in the main contaminated area through 10 fixed wells as first step of a full scale design to evaluate the efficacy of the treatment reagents in the aerobic aquifer. An overview of the remediation approach, results from monitoring actions and field studies will be presented. Measurements of stable Cr(III) in groundwater samples along with the field parameters demonstrated the reagent distribution in the contaminated area and the on-going geochemical reduction of Cr(VI). 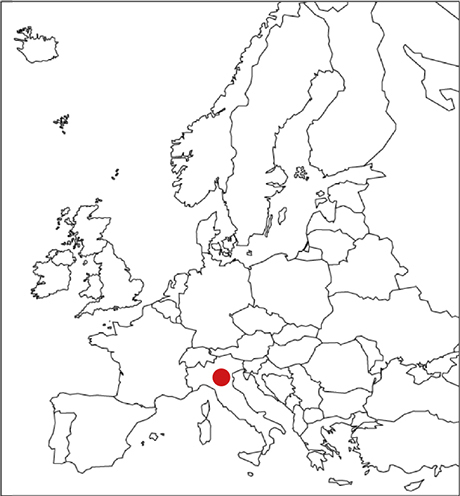 The site is located in an industrial area of Northern Italy and is an active plating facility that produces rotors for the printing and textile industry since 1950s. Chromate solutions were historically used as part of the plating process and the leakage of chromium into the shallow aquifer has been traced over time based on the site’s history. Site investigations and groundwater monitoring since 2008 have shown a plume extending downgradient the source area. Yellow discoloration was observed in different parts of the concrete floors and building walls and yellow soil samples were collected in the shallow vadose zone indicating presence of high hexavalent chromium concentrations. Therefore, as part of the operating permit, the local authorities required a groundwater extraction & containment system at the downstream boundaries of the site as an emergency treatment plan. In 2011, the P&T system showed an asymptotic Cr(VI) concentration trend that triggered a different remediation strategy at the site. Further soil sampling collected at approximately 20 m bgl (below ground level) in saturated zone below the source showed up to 500 mg/kg hexavalent chromium and 700 mg/kg total chromium, while a sample collected at 11 m bgl in the capillary fringe contained up to 700 mg/kg hexavalent chromium and 770 mg/kg total chromium. 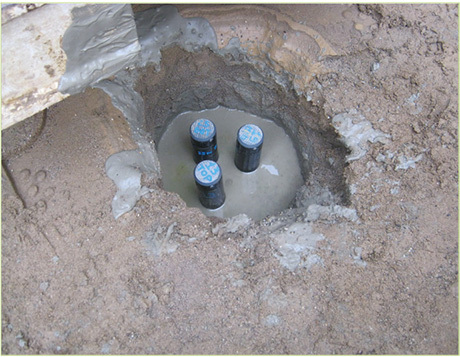 Groundwater samples showed up to 100,000 μg/L between the two main source areas (Fig.1). In addition, Hexavalent Chromium concentrations and geochemical sampling data indicated that no natural attenuation was occurring, with no evidence of Cr(VI) reduction to Cr(III) . Therefore, in order to treat the soil and groundwater contamination in an efficient and cost-effective manner, in 2011 MRC and 3DMe technologies were selected as remedial technology because of their proven ability to reduce and immobilize hexavalent chromium in situ. In early 2012, a MRC and 3DMe application was performed in the main contaminated area through 10 fixed wells as first step of a full scale design to evaluate the efficacy of the treatment technologies in the aerobic aquifer. 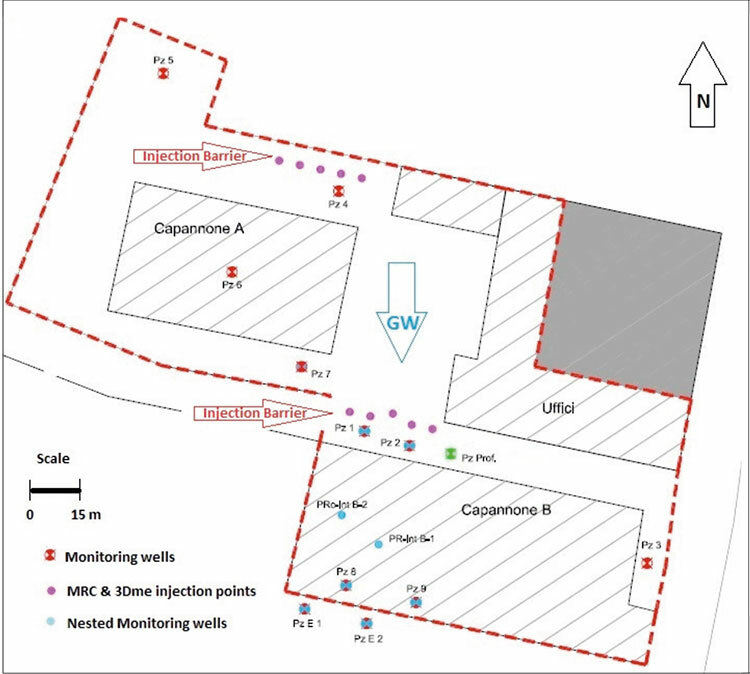 At the end of 2011, the first phase of full-scale groundwater remediation was implemented by installing two injection well barriers, upgradient of the two main hexavalent chrome (CrVI) source areas (some parts of Capannone A and Capannone B) (Fig.2). Each of the 2 barriers consisted of 5 nested injection wells, giving a total of 10 wells. The nested injection wells were installed at approximately 4m intervals, with each well consisting of 3 standpipes. 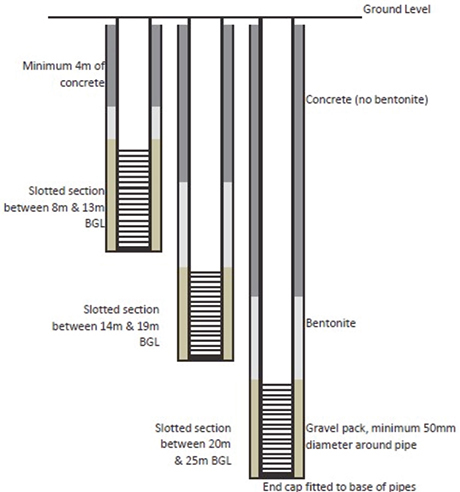 The shallow pipe was installed with the slotted section from 8 m to 13 m bgl, the middle one from 14 to19 m bgl and the deep one from 20 to 25 m bgl (Fig. 3-4). This arrangement allowed a proper distribution of the reagent in the different vertical zones of the aquifer. In addition, 4m of concrete to the surface was installed to withstand injection pressures. Following the installation, the wells were developed to clear them of silt. Before the injection work commenced, a monitoring campaign was conducted to establish groundwater conditions with regard to Total Cr, Cr(VI), Cr(III), Dissolved oxygen (DO), Oxidation-Reduction potential (ORP), pH, nitrate, sulphate and Total Organic Carbon (TOC) concentrations. Analysis confirmed the highly aerobic conditions of the aquifer. MRC and 3DMe products were injected into the wells under pressure using an inflatable packer to form a secure seal. As the groundwater table was around 15 m bgl at the time of the injection, about 7 metres below the usual level, the injections were performed only through the middle (14-19m bgl) and the deep pipes (20- 25m bgl). Within about 60 days from the injection of MRC and 3DMe in January 2012, hexavalent chromium concentrations decreased to below the detection limit (5 μg/L) in Pz4 monitoring well (located few meters downgradient the injection barrier), while Cr(III) concentrations increased as good indication of ongoing reductive process in the aquifer. to 10,000 μg/L and the Cr(III) about 300 μg/L. The Cr(III) is stable and insoluble under the natural aquifer conditions and precipitates out the solution with different timing depending on the pre-treatment Cr(VI) contaminant load. The same Cr(VI) decay trend was observed in Pz6 (located about 10 meters downgradient the injection barrier) but with a time lag of about 4 months compared to Pz4 (fig.5). About 12 months after the injection, Cr(VI) concentrations in groundwater have decreased in the downgradient monitoring wells of the site by between 59% and 99% while Cr(III) concentrations initially increased, then gradually tailed off, likely due to the precipitation process. The different behaviour in results between wells may be caused by seasonal aquifer effects, distribution of the reagents in the subsurface, and/or significant sorbed Cr(VI) contamination in specific areas of the aquifer. Additionally, the action of MRC and 3DMe has been tracked through oxidation reduction potential (ORP) and the total organic carbon (TOC; the sum of lactic acid, pyruvic acid, acetic acid, butyric acid and propionic acids). TOC represents the total carbon source that in turn provides the anaerobic environment needed for the degree of Cr(VI) reduction to date. A decrease in ORP and an increase in TOC are characteristics of successful MRC performance. These trends are displayed within Pz4, Pz2, Pz6, Pz9 and PzE1 (Fig.6; locations of wells in Fig. 2). The distribution of reagents over time has been shown through the reductive conditions (ORP) established in the aquifer and the TOC concentrations detected in the monitoring wells. 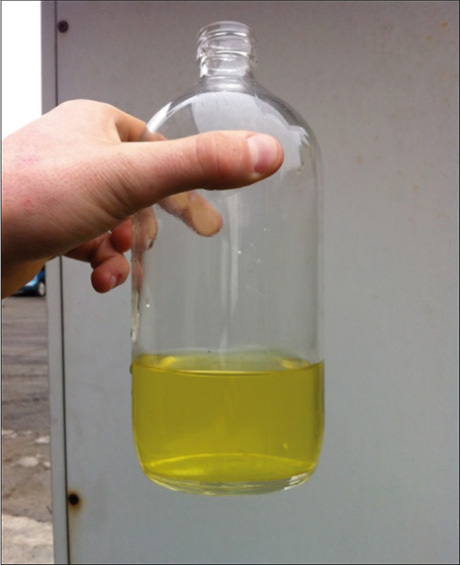 More specifically, attenuation indicators in the monitoring wells have demonstrated anaerobic, slightly-reducing conditions within the main contaminated areas, likely between nitrate- and iron-reducing conditions. Site groundwater in the treatment zones shows low concentration of DO (less that 2 mg/L) and nitrate (less than 0.5 mg/L), ORP levels between -50 and -100 mV (relative to hydrogen, Eh), and high concentrations of dissolved iron Fe(II). 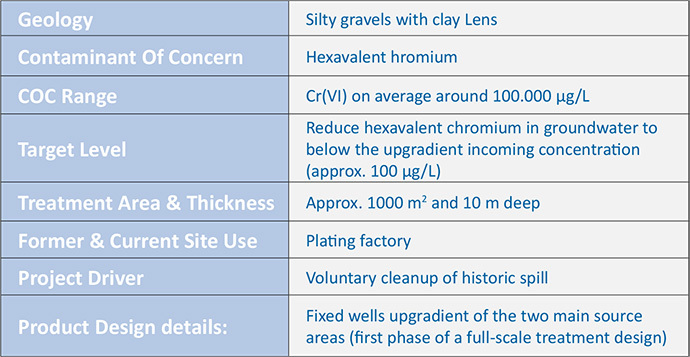 The goals of the phase one treatment have been achieved as hexavalent chromium concentrations at the site were reduced within the main monitoring wells and very good reductive conditions have been established in both source areas. In situ metals immobilization applying MRC and 3DMe is an alternative to the traditional engineering, design and capital-intensive approaches of physical extraction and treatment systems. In fact, during the first phase of treatment, a substantial decrease in dissolved hexavalent chromium has been observed following the application of MRC and 3DMe technologies into the aquifer, both in the treatment zone and in the downgradient areas. The distribution of reagents over time has been shown through the reductive conditions established in the aquifer and the TOC concentrations detected in the monitoring wells. More specifically, attenuation indicators in the monitoring wells demonstrated anaerobic, slightly-reducing conditions within the main contaminated areas, likely between nitrate- and iron- reducing conditions. Site groundwater in the treatment zones showed low concentrations of DO (less that 2 mg/L) and nitrate (less than 0.5 mg/L), ORP levels between -50 and -100 mV (relative to hydrogen, Eh), and high concentrations of dissolved iron Fe(II).